Today I have some exciting news from my little corner of NC. 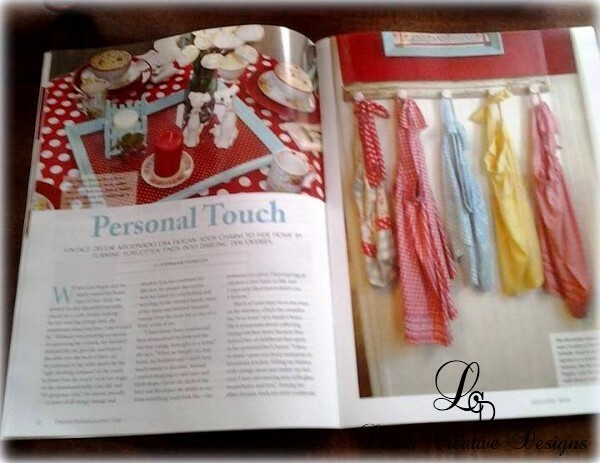 A few months ago I was approached by a writer doing a piece for Treasures Magazine. 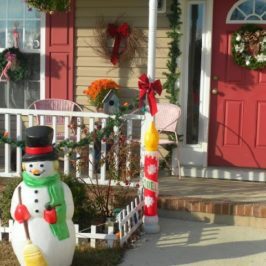 She found my blog online and wanted to feature my home in an article on ways to decorate with collectibles. I was tickled!!! I emailed her a bunch of photos, did an online interview and then anxiously awaited for the issue to come out in January. 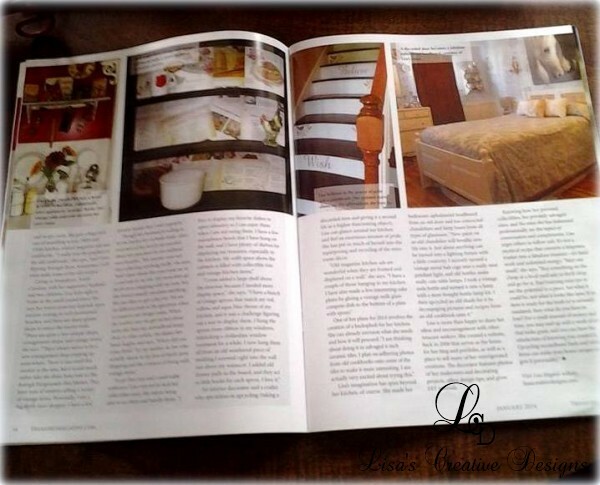 When my copy of Treasures magazine arrived in the mail I ran inside to see it! 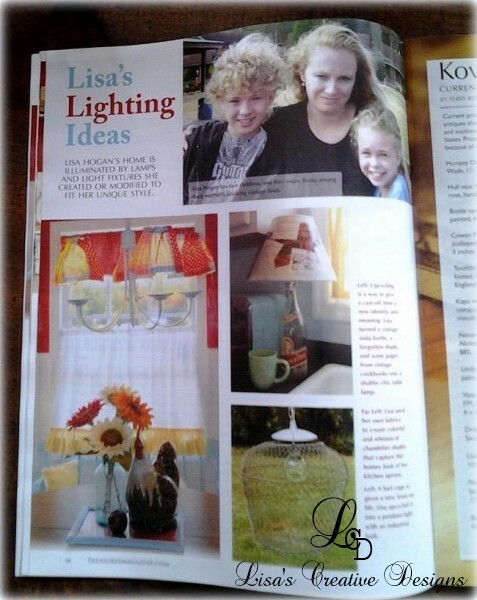 I was surprised and ecstatic to see a four page spread with photos and a great little article about my work and decorating ideas. My daughter almost died when she saw her picture in a magazine! 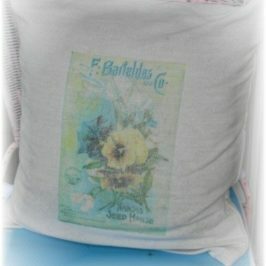 There were photos of my staircase makeover, my upcycled door bed in my master bedroom, some DIY upcycling projects I have completed and some photos of my kitchen. 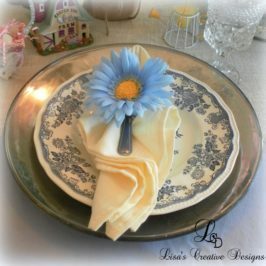 The very first featured photo is a shot of a Cozy Country Cottage Kitchen Tablescape I created in my kitchen a while back and I want to share that with you today. 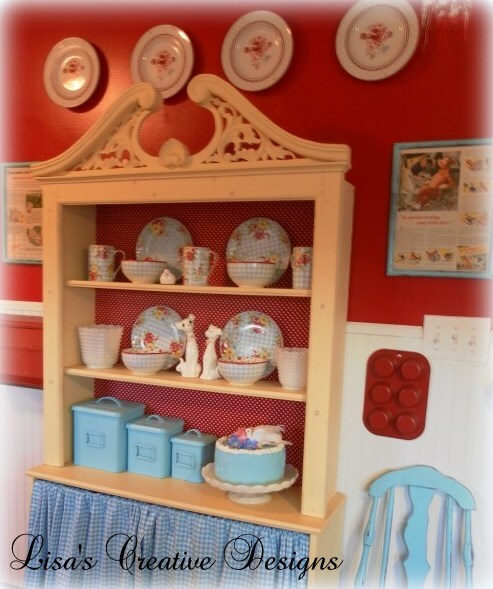 I am a sucker for red and white polka dots and I love aqua blue and red paired together, especially in a kitchen. 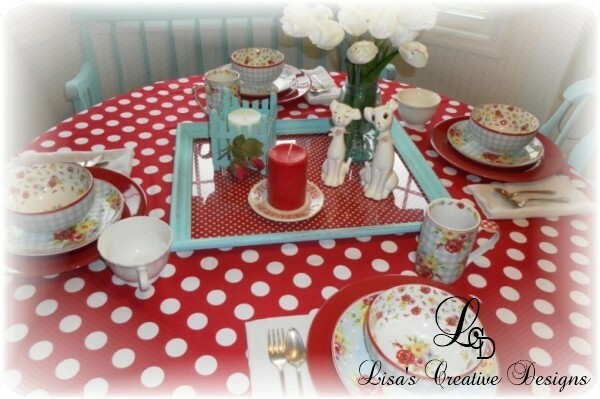 I started the tablescape with a large piece of red and white polka dotted fabric. 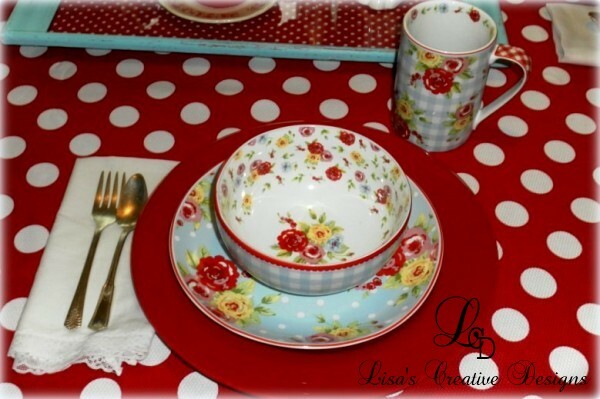 I bought these adorable floral cottage inspired dishes in Marshalls on clearance one day and snatched them up. I knew they would blend in nicely with my cottage style decor. 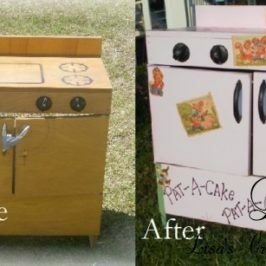 When they aren’t sitting pretty on the table I display them in a buttery yellow shelving unit I got from a friend. I love this piece. 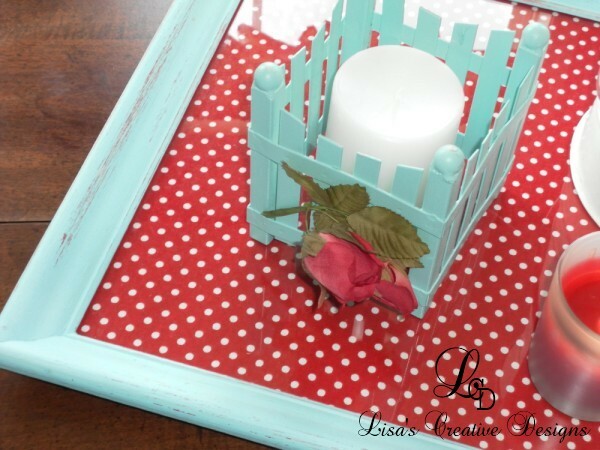 My centerpiece of the country tablescape consists of an upcycled picture frame serving tray I made a couple of years ago. 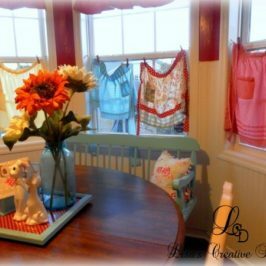 A couple of vintage dog figurines, a vintage canning jar filled with silk tulips and a few other accessories complete this fun, whimsical Country Cottage Kitchen Tablescape. 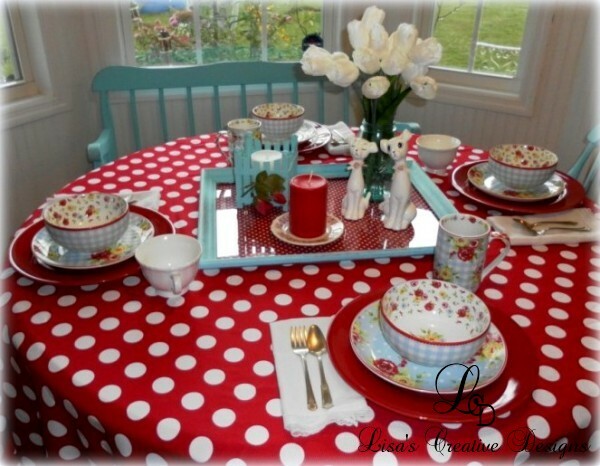 Who needs coffee when this bright and cheerful tablescape could really wake you up in the morning?! OMG Thanks so much! Sorry I haven’t checked my comments in a few days. I will have to go check out the party! How wonderful and exciting. Congratulations on such an honor. The photos are gorgeous.